It’s hard to believe we are already in the final stretch of 2017! It was a busy quarter for us as we’ve been working on adding new features designed to improve your experience with the services as well as spam, phishing, virus, malware and ransomware detection & protection (among other such threats). 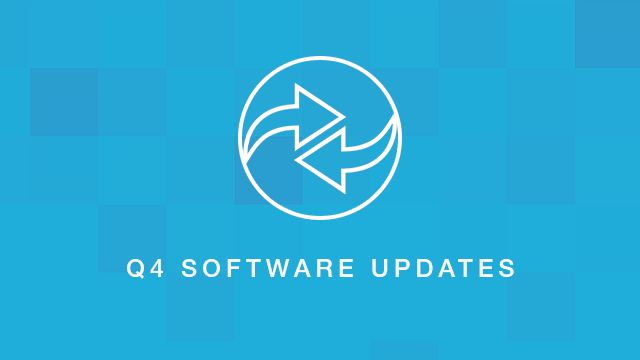 In this blog post, we’ve highlighted the most important updates of Q4 2017. For a comprehensive list of new features and improvements, please visit the changelog in our knowledgebase. The new sender and recipient whitelist and blacklist pages have moved out of ‘preview’ so it will be used by all customers (with access to those pages) rather than by only the ones that have ‘features preview’ active. The new pages offer more flexibility in finding addresses that are whitelisted or blacklisted, load faster, and are more consistent with the rest of the new pages in the control panel. Users that have ‘features preview’ enabled have a new quarantine page (both incoming and outgoing). Rather than a completely separate system, the quarantine link will take you to the log search page, with all filters and columns selected for viewing the quarantine. The added consistency means that users have less to learn, and the new page is both far more customisable than the old, and also far more compact when viewing results. All the actions you’re used to take on the old quarantine pages are also available via the preview Log Search pages. The custom filtering rules functionality, which lets users create and manage their own rules for whitelisting and blacklisting messages has become available to all super-admin and admin users, not only for those who have “features preview” enabled. The custom rules are managed on four pages, one whitelist and one blacklist for the incoming and outgoing filters. Note that the outgoing whitelist page is only available to super-admins by default. Users start off in the “simple” version of the page, but can themselves change to the “advanced” version (where they write ‘regular expressions’ to create rules) from their Profile page. For more information about the custom filtering rules functionality, see our knowledgebase article. The custom filtering rules pages, where you can create your own filtering rules, (available when “features preview” is enabled) have a new, easy to use, mode. If you want to create a simple rule like “quarantine all messages that contain the word ‘avocado’”, then you no longer need any knowledge of “regular expressions”, and can easily add rules like these. If you’re trying to add a more complex rule, or if you are comfortable with regular expressions, then you can switch back to the “advanced” mode in your User Profile page. Users at the domain, admin, and super-admin level are now able to customise the links that appear on the dashboard. You can move groups of links around, add or remove links from a group (including links to external pages, like the knowledge base or your own support system), and add or remove groups. The customisations that you make are saved for you personally, and do not impact any other users. Please see our article on Customizing Dashboard here. If you have “features preview” enabled, it means you have been trying out our new version of the sender & recipient whitelist & blacklist pages in the control panel. With this update, you’ll see that there is a new tab when viewing the pages at ‘domain level’, “default senders”, or “default recipients”. On this tab, users at ‘domain level’ are able to view the senders/recipients that are whitelisted/blacklisted by default (cluster wide). There is also a new toggle on the right: “use default values”. This means that users are now able to decide between using only the default list, only their own list, or the combination of both. There is also a handy action available from the action menu in each row that allows you to make a duplicate of an item – for example, perhaps you like one of the defaults, but want to tweak it a bit for your own use. This brings more information about what each of the classification results means to the preview version of the new log search pages (a reminder: to enable these, simply go to your User Profile page and change ‘Features Preview’ to active). On the log search page, you can use the ‘classifications’ link in the page description to bring out a sidebar that has an explanation of each of the ‘sub class’ classifications, incorporated in the ‘main class’. For example, if you’re seeing a subclass of ‘statistical-method2-cluster’, you can simply look this up in the sidebar (there’s a handy search field to make this faster) and see that this means that ‘the message content was statistically very similar to other messages that have been trained on this cluster’. If you’re seeing a subclass of ‘ehlo’, you can look that up and see that it means ‘the sending server identified itself using characters not permitted by the user’s settings’. For security reasons we recently adjusted our processes in regards to handling support tickets from unregistered email addresses. Where before we would allow any contact from a domain to open a case, we are no longer able to access your products/details, until the support request is initiated from an authorized email contact. You can add/remove authorized email addresses directly at https://my.spamexperts.com/ (MY DETAILS – MANAGE CONTACTS). Alternatively, you can open a support ticket directly from the portal after login. Thank you for reading! We wish you a successful 2018 and we invite you to drop us a comment in the section below. I mentioned this before. I love the changelog. I want to be up to date every release. I dont have the time to log into the changelog section and read through it. I am a rss guy. Please add rss button for spamexperts changelog. Thanks. Thank you for the feedback. We have passed it to our support team who is in charge of the changelog section.